In World War One it is estimated that 2,272,998 British soldiers were wounded. Not including the 16,682 Navy and RFC/RAF. Of that number 64% returned to duty to fight on the front lines. In King’s Lynn places like the Hanse House were converted into hospitals to cope with the sheer amount of walking wounded returning from the Front. 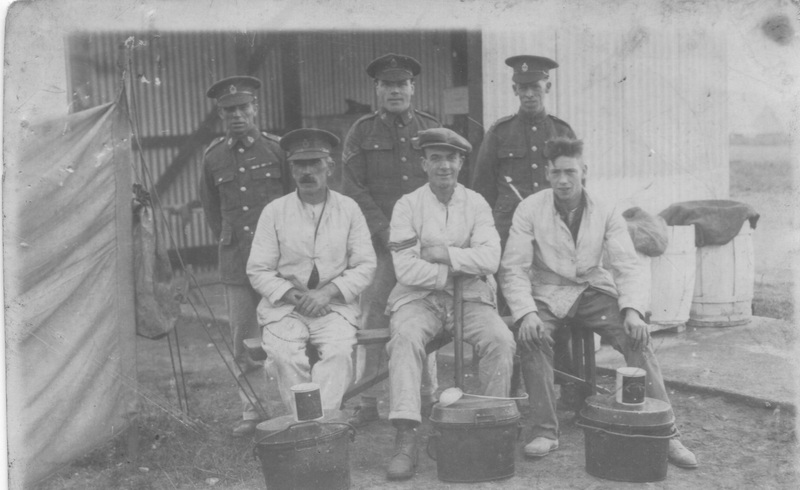 A group of recovering soldiers at Thorpe St Andrew, Norfolk War Hospital. One of that vast number of wounded was John Smith Sampher – Private 2nd Battalion Middlesex Regiment – 203325. Last summer we posted the research undertaken by Alan Riches in to his great-uncle’s war service. 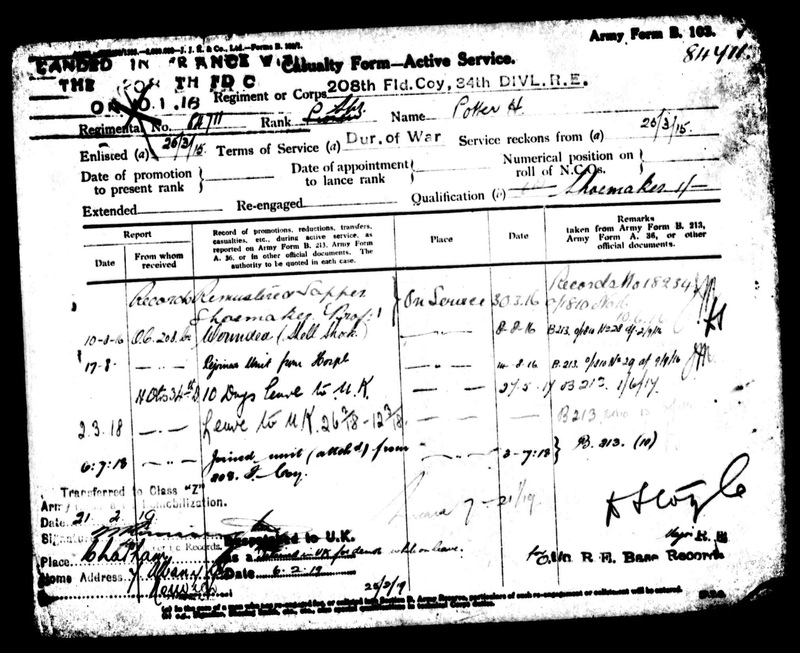 We’ve now been contacted by another blog reader who’s great-grandfather probably served alongside Harry Hazel. Herbert was my great-grandfather who died in 1958, before I was born but my father remembers him. He was a rather tall and elegantly dressed man but over time developed a pigeon chest as he struggled for breath after a WW1 gas attack. Herbert enlisted on 25th March 1915 in the same company as Sapper 84711, just 839 men before so they maybe knew each other? There is some debate as to when Herbert came under gas attack, I think this happened on 8 August 1916. From the company war diary, it looks like he and 35 others were casualties of high explosive and (possibly chlorine gas) attack whilst making a communications trench from brigade HQ on the south-west side of Bazentin-le-Petit Wood. His service record shows shell shock from an exploding shell and that he spent a week with 104th field hospital, however it doesn’t mention the gas so it’s possible that it occurred later, my father thinks he heard mustard gas at the Ypres/Battle of Poelcappelle/Passchendaele in Oct 1917. 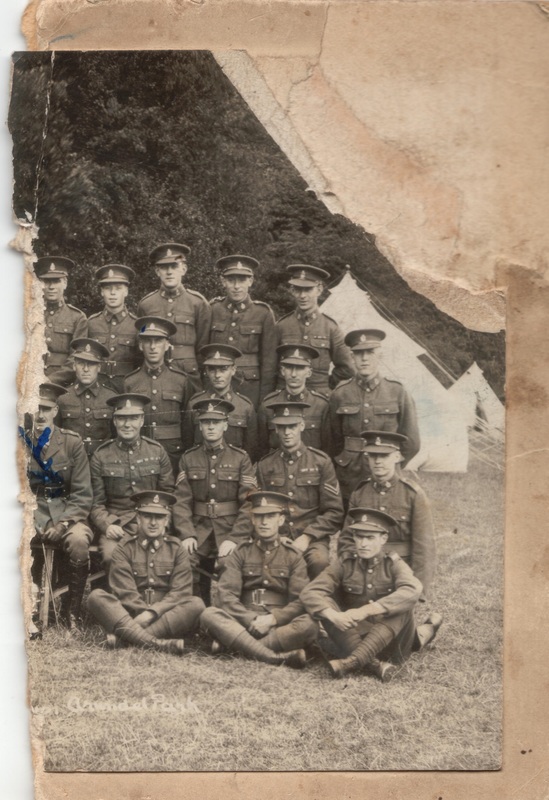 In this torn image Herbert could be in the middle row, second from left with the blue mark on his hat. These are the photos I have, I always thought they were of (part of) the 208th, but the cap badges worry me a bit, perhaps as a territorial unit they were different? 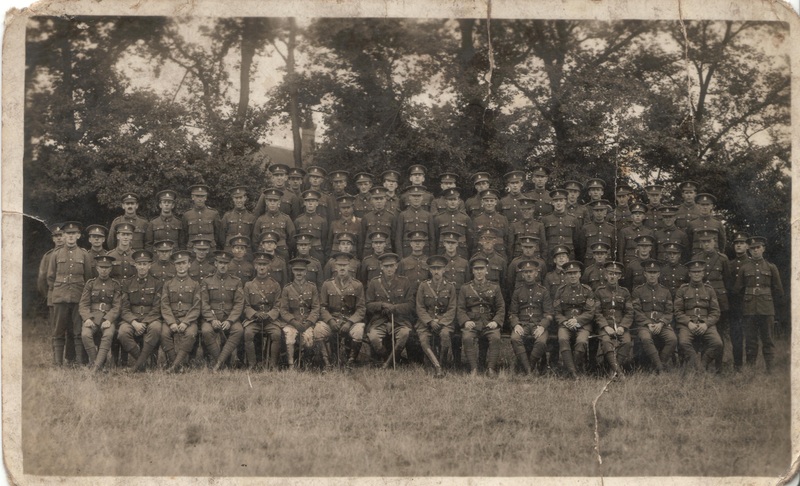 I think there are only 70 men in this picture not the 217 that you mentioned in the previous post so perhaps it’s not a Company but a Platoon? I also notice that unlike other similar photos they have no rifles. From the tents in the background could these photos be from training camps in England in 1915? Not sure about this one either, perhaps a field kitchen in Kirkby Malzeard or in France, although the corrugated iron walls in the background look similar to photos of some temporary buildings I have seen at Sutton Veny on Salisbury Plain. The most amazing thing for me is that his record shows that in Feb/March 1918 he was granted 10 days leave to the UK. Imagine having experienced the horrors of the trenches over 2 winters (including being shell-shocked and gassed), then going home, then after a rest returning to the war! Herbert he survived the war returning to his work as a boot maker in Norwich where after short retirement he died peacefully in 1958 aged 76. Herbert was born in Norwich in 1881 but spent a lot his youth in Bethnal Green. 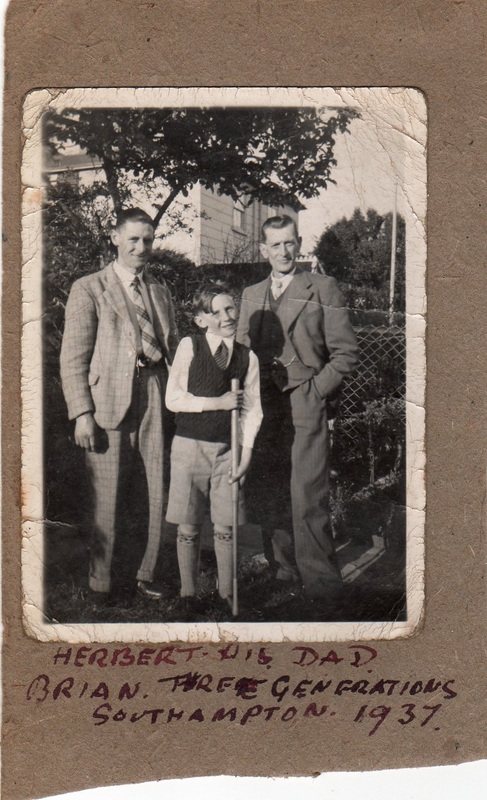 Herbert many years later on holiday in 1937, on the RHS with his eldest son (also called Herbert) on the LHS and his grandson (Brian). Herbert on the left in the Homburg hat in 1939. He died in 1958 at 83 Rosebery Road, Norwich, in his final years he liked to sip half pints of stout in the back room of the Lord Rosebery pub and play draughts. Like most them, he never spoke of the war. Herbert has two brothers, one older (Charles Frederick b. 1876) and one younger (George James b.1888). Charles Frederick Potter was already a professional solder being #4163 in 2nd Bn Essex Regiment and who participated in the second Anglo-Boer War of 1896. He had already retired from the army by the outbreak of WW1 but rejoined as Pte 45624, 2nd Garrison Battalion Essex Reg, forming part of the Nasirabad Brigade, India in 1917. I think he lived until 1960 but not sure. George James joined the 2nd Battalion, King’s Royal Rifle Corps as Rifleman 7696 on 22 August 1914, but died less than a year later on 10 July 1915. He is buried in the Lillers Communal Cemetery, Nord-Pas-de-Calais Region, France Plot: II. A. 34. This is just 3 1/2 months after Herbert joined up. 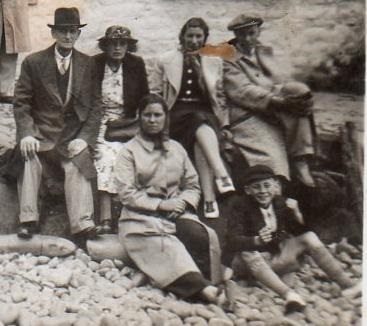 As ever we are very grateful to Simon for sharing his family story with us – please do comment below or email norfolkinworldwar1@gmail.com if you have a story to share or indeed if you can help with any of Simon’s questions. This blog post is based on a recent talk given on 2nd October at the Norfolk Record Office by Dr Claire Chatterton, an Open University lecturer and Chair of the Royal College of Nursing, History of Nursing Society. The general perception of soldiers suffering from shell shock during the First World War has been coloured by literature, films and TV. Officers (upper class) were deemed as suffering from shellshock whilst enlisted soldiers (working class) were shot at dawn. Dr Chatterton’s talk demonstrated that this was not the case, and though 346 soldiers were shot and most of these were suffering from shell shock, it is estimated that 80,000 men suffered shell shock during the First World War, and some effort was made to treat these individuals. The condition was first described by Dr Charles Myers in 1915, but there is evidence that the condition was experienced by combatants during the Crimean War and earlier conflicts. 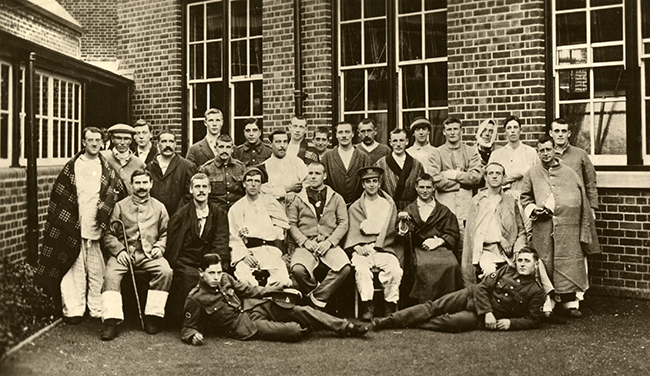 During the early years of the First World War, individuals were sent home and usually went through the Royal Victoria Hospital, Netley. However, as the numbers of sufferers increased, more hospitals were required. Various hospitals and asylums were taken over; and the patients/residents were removed to other institutions, which led to severe overcrowding and death in many cases. Dr Chatterton described these as the forgotten victims of the First World War. There was no unified approach to the treatment of the soldiers; it depended on the medical personnel at individual hospitals. The treatment often followed the Weir Mitchell Cure which advocated isolation, rest, massage and a milk diet. Other psychotherapeutic treatments were based on combinations of baths, massage, drugs, hypnosis, electrical treatments, re-education and occupational treatments. With the line of evacuation being so long, the increased speed of treatment proved to be efficacious. The principals of this system are still used today for the treatment of Post-Traumatic Stress Disorder (PTSD) in modern warfare. It seems that there was a class divide evident in the diagnosis of shell shock in that officers were described as suffering from Neurasthenia whilst enlisted soldiers were described as shell shocked. Dr Chatterton’s talk showed not only the huge numbers of those affected by shell shock but also demonstrated how the treatment of these individuals evolved during the war. To see other Norfolk Record Office free lunchtime talks, and other events related to the First World War, see our Eventbrite.